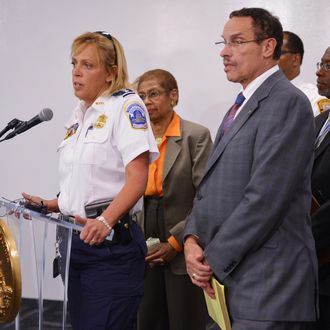 As employees at the Navy Yard continue to wait for clearance to leave after this morning’s horrific shooting, Police Chief Cathy Lanier announced the city was lifting a shelter-in-place order for the neighborhood around the facility as police were no longer searching for a second gunman. Investigators have “exhausted all means available to support or discount” the lookout order issued earlier for a possible shooter in addition to suspect Aaron Alexis. Meanwhile, more information is available on those killed and injured, as well as those waiting to leave the Navy Yard after a very, very long day. Authorities released identities of seven of the thirteen killed, whose families had been notified, in a press release following the conference.They include Michael Arnold, 59; Sylvia Frasier, 53; Kathy Gaarde, 62; John Roger Johnson, 73; Frank Kohler, 50; Kenneth Bernard Proctor, 46; and Vishnu Pandit, 61. Lanier said none of those killed appeared to be active-duty military. The ages of the dead range from 46 to 73, Mayor Vincent Gray said.